Take a moment and consider what the word “elite” means to you. If you’re so inclined, extend the meaning and place it in the context of American soccer. For as long as I can remember, clubs, players, parents, coaches, media outlets, and fans have either laid claim to what elite is regarding American soccer and in the process, used the label of “elite” seemingly for anything and everything soccer-centric. When one hears “elite” in American soccer, make no mistake, it’s seldom in relation to the actual level of play or individual players. Youth clubs tack on words like: “elite”, “premier”, and “academy” to reinforce some perception that the adjectival use of such labels denotes actual soccer quality. American soccer is rife with buzzwords, after all, it’s big business. When consumers see these buzzwords, profiteers see dollar signs. In fact, American soccer and the word “elite” go hand-in-hand quite well. American soccer, especially at the youth levels, is rooted in elitism and the labeling of otherwise average clubs, players, coaches, and leagues is the Standard Operating Procedure for anyone with skin in the game. Labels ensure competition, but not on the field (where it should be ideally). Application to American soccer: This is true. American soccer caters to those with the most wealth and status in a society. Pay-to-play is an established function and given of the American game. Development Academies are “free” when it comes to actual league fees, but the cost incurred for families still ranges in the thousands for travel, food, and gear. The most successful and powerful groups generally call the shots. Application to American soccer: Sunil Gulati, Columbia University lecturer and Special Adviser for the Kraft Group among other pursuits, fits this definition well. Another person of influence in the American game is this guy. Money is a necessary input and those with it or working with those who have it are in a position to dictate the direction of the game. Those who don’t have assets or a sustainable bankroll are not granted a place at the table. Application to American soccer: Granted, there are some odd buzzwords in there, the fact remains that American soccer is elitist. This quick and handy rundown of elite strikingly resonates with how American soccer is run (or run amok). In political and sociological theory, an elite is a small group of people who control a disproportionate amount of wealth or political power. In general, elite means the more capable group of people. The selected part of a group that is superior to the rest in terms of ability or qualities. This isn’t exercise in why socialism should win out over capitalism. It’s the documentation of the long-running state of the American game and two consistant problems with it — labels and pay-to-play. And what does this have to do with American soccer? Everything. American soccer is elitist down to its core. Soccer is widely regarded as an accessible game that can be played by anyone, but it has become a sales-driven colossus of American sporting culture. When people look to establish clubs and teams (at any level) they do so to turn a profit. Is that so bad? Is money evil? That depends on who you ask and what you believe. The world is full of “haves” and “have nots” and American soccer is but one example of how much money is a filtration contrivance that funnels those who have disposable income onward in the game whilst channeling players and families with less economic opportunities out of the game (and into other sports or activities). Actual talent rarely enters the discussion. Around the world, the best players rarely come from affluence. Most of the world’s mercurial talents grew up facing tough challenges that instilled their resolve and sense of humility. Soccer was a way to better their circumstance. If every country used pay-to-play the way it functions in the U.S., it absolutely would stifle and crush any potential for these talents to progress. Like any society run on the mechanisms and principles of capitalism, people exchange their dollars for a service and they leverage their time for said dollars. So, if American soccer clubs charge so much money shouldn’t the product be outstanding? Logically, yes; however, this is American soccer we’re talking about and the product (output over time), although costly, seldom validates the input (cost over time). The American soccer journey for players is erratic. Families must often choose between soccer and other salient expenditures. What people who’ve been through the American soccer system have encountered is a journey laden with pitfalls resembling the most complicated bid-no bid decision tree one could imagine. As a player progresses, the cost of playing increases to the point a player’s (or their family’s) financial ceiling is reached and progress is largely dependent on cost, not necessarily talent. Player progression is often halted by systemic regression and stagnation. The Development Academies, however, are not the enemy — they just aren’t true academies in the global sense of soccer development and in relation to the foreign academies they aim to emulate. More DA’s will undoubtedly spring up, which is promising if, and only if, they address the needs of the community and actually scout, unearth, and foster rather than recklessly fast-track the talent to the next level. Additionally, starting an “academy” at the U-13/14 age level already puts players several years behind successful academies around the world. Watching the Development Academy system take root since its inception and watching my wife’s brothers play in said system has “afforded” me a unique perspective. It’s not free for non-MLS DAs and it’s a work in progress. I’m left wondering if the Development Academy system, like the “select” soccer system before it, is confronted with the drudgery of balancing not being accessible enough (see pictures above) or not being selective enough. I’m also left wondering if “Academy” is simply a glossy label added to the list of American soccer buzzwords (yes, it is). Perhaps the entry fee for Development Academies is just as much about the size of one’s bank account as it is actual soccer talent and potential. 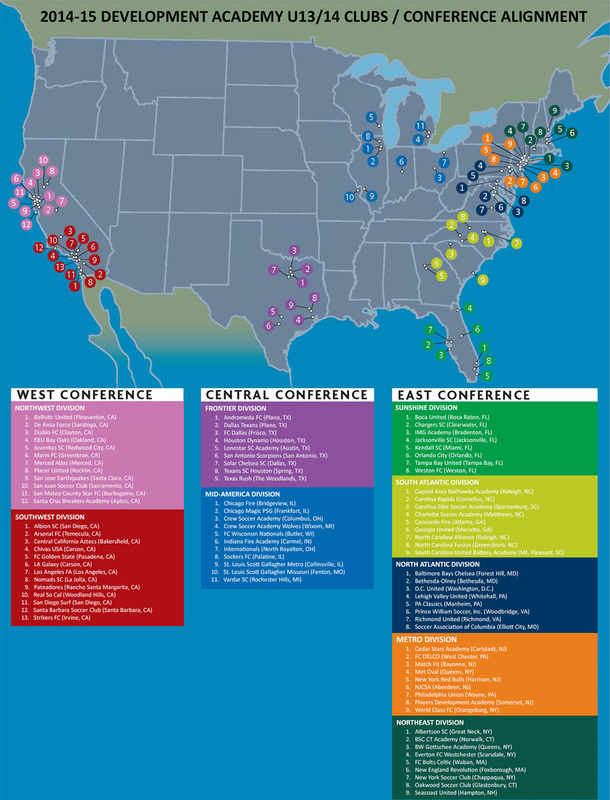 To date, most Development Academy teams are comprised of players from mainly suburban areas, of some degree of affluence (the financial burden is being addressed by many clubs), and is still largely producing the same type of player that emerged from great teams and clubs before the USSDA system was introduced in 2007. The majority seek out Development Academy soccer because it increases their chances of being recruited, spotted, and offered a collegiate scholarship and maybe, a professional contract. And who could fault a young player for competing for valuable scholarship and educational opportunities — especially when Major League Soccer salaries oftentimes are less than what a player armed with a great degree from a good university can earn in the corporate or professional world? Does a player with a degree earned on scholarship money see making the league minimum as a risk worth taking? Does the league, labeled “Major” pay enough to attract and retain domestic non-DP talent? Ultimately, the onus is on the player to choose a path that accommodates their goals and demands in life. Playing professionally is a once-in-a-lifetime opportunity. That being said, for all the money spent on training, “select” club soccer, travel, and the numerous other expenses in a player’s journey to where ever their ceiling in the game is, the struggle for many promising players remains: can I afford to make the league minimum? Granted, contract amounts vary and serious players with the ability are hungry enough (literally and figuratively) to play for anything, there are no guarantees (nor should there be). That conversation is one of many we have about Major League Soccer and the state of the American game. Regarding a long-term player development project I’ve dedicated myself to, I consulted a Dutch colleague who has worked with the KNVB for many years about the American soccer development system as he sees it and a few points stuck out. Me: Describe American youth soccer in a few words. Jan: Complicated. The system punishes players who are good yet have little money. Rewards players who are rich. Me: Explain why you think this. Jan: OK. I have worked in America and in the Netherlands over 25 years. Never in my life do I see a club labeled elite in the Netherlands or in Germany when I was a professional. In America, every club is called “elite”, “select”, “premier” and this is confusing. Me: What confuses you about these labels? Jan: How can there be so many elite clubs? Only a few clubs are elite. Elite, to me and in football, means the best of the best in quality, not status. In America, clubs who say they are elite simply are considered elite, but don’t produce elite results or players. How come? Me: Player development isn’t the key motivator for many clubs. Making money is. Using these labels is a way to accomplish making money. Jan: So Americans would rather make money than make great players? My friend, this is the reverse of how football happens outside of America. In many respects, American soccer is elite. The system is dependent on labels slathered over any club willing to lay claim to greatness via a naming convention. What my Dutch colleague pointed out wasn’t news to me, but it did highlight the convolution and misconception of what people in American soccer circles tend to do, which is label clubs, players, teams, coaches, etc. with praise-heavy terms such as “elite”. Although it’s easy to point out the problems, it’s far more beneficial to point out the solutions. Elitism is one roadblock in the American game. More investors need to channel more capital to development levels of the game, but why invest when their is instant profit to be had? What pressure is on the United States Soccer Federation and the other entities running the game to reduce pay-to-play? After all, coaches and clubs need to make money. Coaches have a right to make a living. The problem isn’t necessarily pay-to-play, but rather it’s exorbitant pay-to-play without good enough results. If one pays thousands of dollars a year to play the game only to emerge with partial scholarship offers to a collection of schools, who is at fault? It could be a chicken-or-egg quandary. Truthfully, no one can fully predict the performance capacity and “potential arc” (J-curve vs. S-curve) of a player. Like any investment, the lack of Return On Investment (ROI) is the risk. The more cost is a factor for the [best] players, the less likely holistic progress can take place. Those players are lost to other sports, other activities, or are excluded far too often and far too early. Players are making decisions based on what a club can do to better their [future] circumstance. 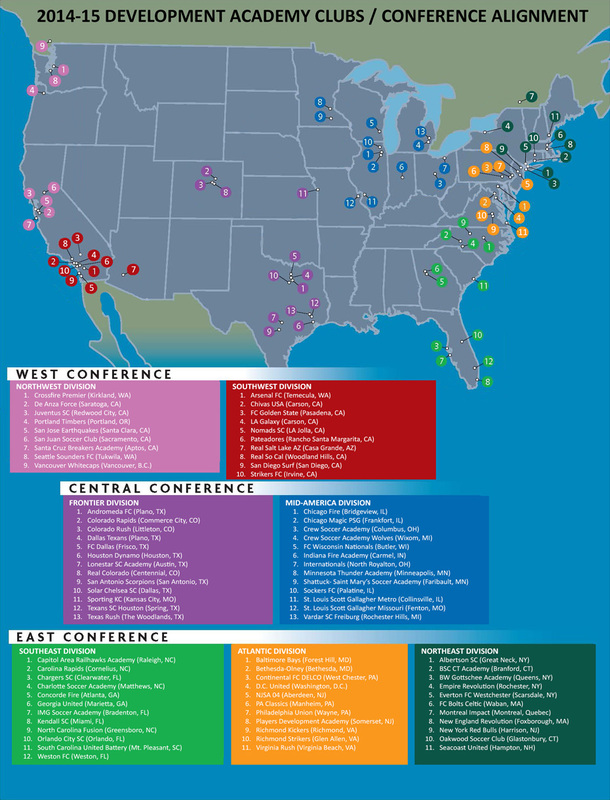 MLS and Development Academies are producing (or helping to produce) promising players who end up playing collegiate soccer. Personally, I don’t see this as a failure, but I don’t necessarily see this as success. The larger concern is hardly that these players opt for college soccer (many are playing for the education and to their actual talent level), but how many players are phased out well before they have a chance to really excel because they literally bought into something labeled “elite” that really turned out to be average? American soccer and the consumer at large must either see through or remove the labels — because for the foreseeable future, American soccer will continue to be a buyer beware enterprise. American soccer isn’t elite at all. It is, however, elitist to its core. One of the problems you describe here is easily solved: Just let MLS players have outright free agency. I don’t understand why the Re-Entry Draft mechanisms are needed. I understand why the allocation money system still exists — it’s a parity mechanism left over from the days when players were actually “allocated” in the start-up days — but I think it can be replaced by tweaking revenue-sharing rules. Extending the DA — and, more importantly, absorbing the costs so these kids play free — is more of a challenge. That requires a good bit of money. It’s a lot easier in geographically compact places like England. No question it’s a worthwhile goal, but I wonder where the money’s coming from. The “elite” label, along with “premier” and “champions” and so forth, is absurd. And absolutely elitist. Tons of parents attempt to justify the time and money they’re pouring into their kids’ soccer activities by saying, “Well, he’s in the *elite* league.” That has to change. In some ways, we’d be better off if everyone just played rec soccer and high school soccer. You’d just need to get good coaches in there and let them earn a decent living. Living in England, I’d say Americans have a misconception of academies here. The game is so popular over here that there are literally hundreds of clubs, not just the premier league, championship, league one/two that some are familiar with. These clubs, whether pro, semi pro or even amateur, have multiple teams (first team, second team, even sometimes a veterans team for old guys like me). They all also generally have development centres for kids and the larger ones academies, which are full time schools with no misconceptions- their goal is to produce professional players. The players when old enough are sold through transfers to other clubs, and the selling club uses those funds to continue improving its operations. The reason it works here has nothing to do with a smaller geography, it’s simply the way it is designed and the vastly greater interest in the game at all levels (not just kids and pros). It is not designed as a development program simply for the sake of a development program for aspiring players.